A fast, glorious, and punctual sunset is a perk of equatorial living. Once the sun starts its steep downward slide at 5.50pm there is barely time to prepare a rum and coke before it drops below the watery horizon. The sky, in its trail, turns scarlet, purple, pink, and the air fills with the heavy scent of ylang ylang. You stop everything you are doing to enjoy this spectacle for ten minutes. Then the light is switched off, the world goes away until dawn, and you continue with chopping onions, or playing solitaire or some such banal thing before going to bed and waking the following morning to find the light’s back on. To my mind, this is infinitely better than sunsets in the more northerly northern hemisphere which are either scheduled ridiculously early, or drawn out to such a degree that people, compelled to make the most of the late evenings, become cold, tired and fractious, eventually abandoning their barbecues, to go inside to watch the X-Factor results. I don’t like to think too much in case I can’t pull the line back in (especially here, alone, on the edge of so much space), however the drama of the setting tropical sun is conducive to deep thoughts. Many, many years ago, Fitz and I would sit on the steps of the house in the post-dip glow and discuss life and ambitions. Now when he’s here, we talk about the past. We have a good wry chuckle at this because he’s gone to a hell of a lot of trouble and sunk a fortune into drawing this conclusion. Obviously it’s something I’ll remember before I pack my bags and set off to see what’s around the next corner, when I live my life again. 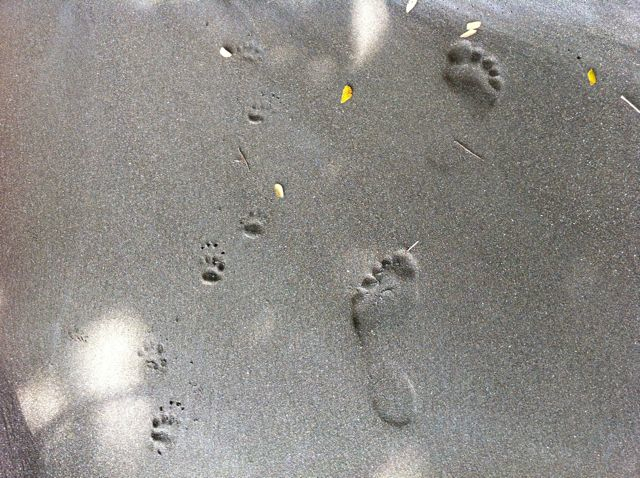 What to pack for many months in Costa Rica on a tropical beach backed by jungle, miles from anywhere? Day shorts, evening shorts, a wide selection of repellent, trousers, long-sleeved shirt, and trusty rubber boots (although they are best bought locally from the kind of shop that also sells seed, aluminium pots, and rope). I would also recommend swimwear, underwear, long books and a torch. I have many hats, but I don’t often wear one – I don’t stand around in the sun much either. How little you need is on my mind as I’m packing up ready to move on. My damp and mouldering possessions are on the floor and on the bed, but not as yet in the heavyweight plastic bin liners that constitute elegant luggage round these parts. Obviously I have laptop, hard drives, leads, adaptors, tripod and camera equipment, as well as an enormous pile of books on pods and Central American history, but I also have silver sandals, a chiffon shirt, a long dress. The things I haven’t used look at me balefully – not just the still un-transcribed interview tapes, but running shoes and empty Moleskin notebooks, and, particularly, a beautiful, untouched, set of watercolour paints and brushes, a gift from my ma, and the coloured pencils and artist’s pad, from my son. What expectations did I have for my life here? What good things did my family expect of me? These things, unused, are quite a torment. What an extravagant gesture this has been. People say that possessions possess us; that we are encumbered by what we own. I have abandoned a lot, but now what I have left I’d like to keep. I’m not sure I have roots, but I have some things that hold memories, and others that represent dreams. I need to find my somewheresville, put everything in it and paint some pictures. Of course first I have to get everything onto a boat. Well, I’m sometimes embarrassed by the simplicity of some of the delicious recipes in the work-in-progress that is The Osa Cookery Book, but as Einstein said, “everything should be made as simple as possible, but not simpler.” I’m not sure what that means, however I think, in general, he would have approved of my approach to meal preparation. I suppose you could make the crackers. A box of 64 packs was sent down to me on a boat and so, happily, in this case I haven’t had to – and I wouldn’t know where to begin. 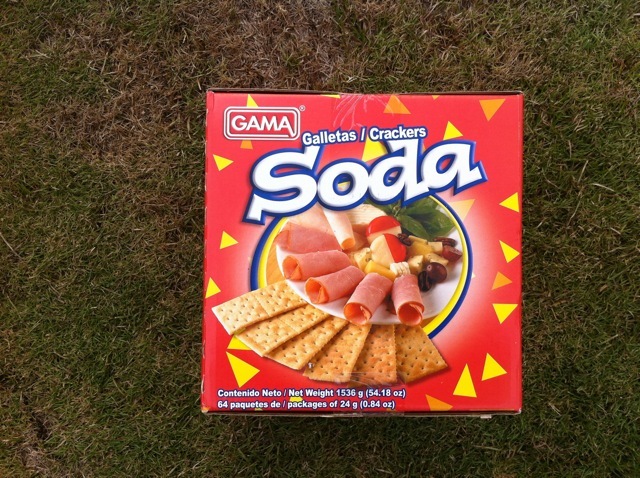 Ingredients: soda crackers, tomato, salt. Recipe: fairly self-explanatory. Actually, for an interesting variation on this recipe, you could substitute avocado for the tomato . . . or an anchovy, although I haven’t seen one of those for months. Sometimes in the dead of night I hear the low droning thrum of a boat moving fast, from south to north. I’ve stood outside in the pitch black to look, but there are never any lights. It’s likely they are drug boats running up the Pacific from Colombia to Mexico and the United States. The traffickers strip them right down in order to carry the maximum amount of fuel and cocaine, paint them grey, pack on powerful engines, and they pass by here, not far off the coast, usually around 3am. Since January of last year, there has been a coordinated multinational effort to patrol Central America’s coastlines. Operation Martillo, as it’s called (martillo meaning hammer), has necessitated or enabled (depending on your politics) an unprecedented level of US involvement in Costa Rican security. Homeland Security keep tabs on trends in trafficking, and the conclusion of a recent subcommittee hearing is that most drugs from Colombia no longer go north via the Caribbean, but travel up this coast, the Pacific coast. Presumably they’ve stepped up the number of patrols, but if so they must be focusing on the Central Pacific area around Manuel Antonio, because there’s not much going on round here. Possibly, ironically, as a consequence of the threat of patrol vessels, instead of attempting to shoot past Costa Rica, traffickers have been avoiding the interception hotspots by landing the drugs in remote areas along the coast to be collected and moved on by road. Costa Rica’s vast, unpopulated, jungly national parks, protected by a woefully small number of guards and volunteers, make an ideal drop off point. A few abandoned drug boats, signs of drug trafficker camps, new, rough roads have been found, along with the occasional trafficker and cocaine haul. Round these parts there’s little distinction between the parks and the sparsely-populated peripheries – in fact there’s a fine specimen of a Colombian drug boat that was found in the labyrinthine mangroves now parked beside the kiosk-sized police station in Sierpe. Some 15 tons of cocaine was seized in – and off – Costa Rica last year, a record high. But there’s also plenty of evidence that much more is getting through – more drug consumption, more drug-related crime, revenge killings between rival traffickers, more cash in private banks, more money laundering, and more suddenly wealthy locals. Moving drugs across land has to involve a degree of local cooperation, and for low paid workers the temptation to be ripped off and dragged down into criminal activity for what appears like high returns, can evidently prove too much. More pitiful than the recruits are those people who find packages washed up, or stashed in the undergrowth, and decide to make off with them. Some years ago, I wrote about how teenagers, some as young as 14 and 15-years old, were setting up business as drug lords in Belize City after finding waterproofed packages of cocaine on the beach. Whole areas of Belize City were out of control at that time, as child-dealers protected their turf with semi-automatics, and their penniless buyers mugged and murdered – often their own families – for the cash. I spoke to an old woman who’d had her gold teeth removed. Not nice. Some of the packages had intentionally been dropped from boats where they would float ashore roughly in the area of of a designated pick-up point, others had been jettisoned. Either way, there was always someone looking for their lost property. A few months ago, I was swimming by a ranger station where some packages of cocaine had just washed up. 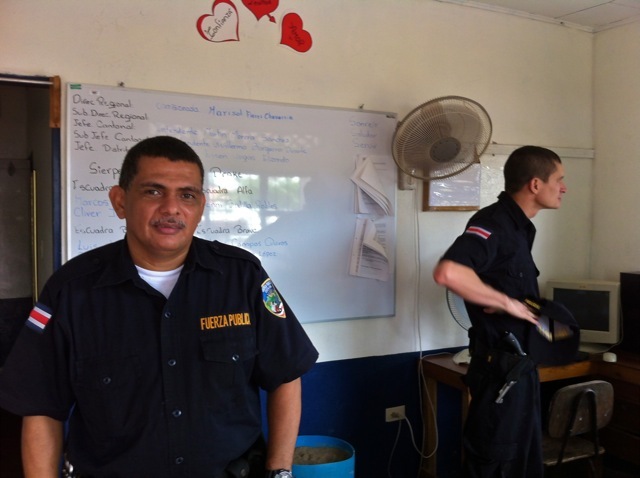 The rangers radioed the police and the Guardia Costera arrived to collect them. Around the same time, the watchman at the next remote property along the coast from here, went missing. They say he found something he shouldn’t have found on the beach, and that blood and signs of torture were found at the property to suggest he was made to give it back. When I was next in Sierpe, I spoke to my friend at the police station who said they had continued to search for him for eight days but with no luck; that they could only hope that he’d got away and gone into hiding. Anyway when I hear those boats I keep my fingers crossed they just keep going, but I can’t see everyone returning to an age of innocence any time soon. Back at the beach house, there are instructions for the ship to shore radio (also useful as shore to hotel radio: ‘If the tractor is coming down again today please can you bring a bag of ice and leave it at the boathouse?’) and also old guides and manuals for dealing with various location-specific problems, like heatstroke and ants. 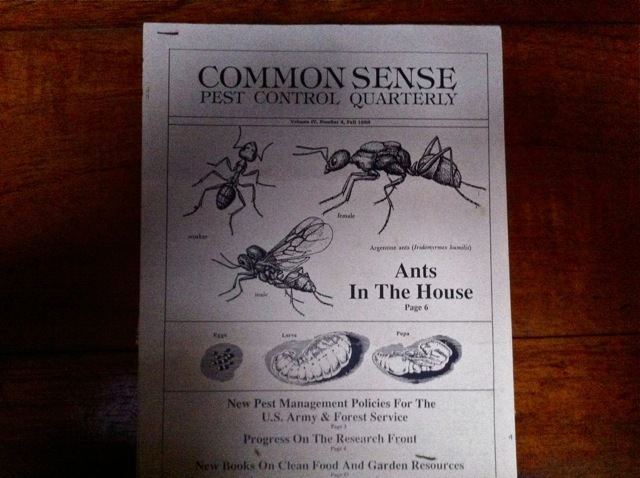 My favourite is Common Sense Pest Control Quarterly which I’ve read cover to cover several times, while sitting in the swivel chair with the rain battering on the roof. In The Naked Jungle, (1954), Charlton Heston and Eleanor Parker battle to save a plantation house that stands in the path of a two mile wide column of army ants. I can’t remember what they do. Fitz told me that once he had a massive column of army ants left-righting their way up to the house, and the advice he got from his jefe de campo was to let them come on through, the theory being they’d give the place a good clean-up and then move on. That is common sense, although it’s not the advice they gave in the Quarterly. (It’s also possibly apocryphal, given that at least four people have told me that tale.) It’s not what I did either when we had a gang of ants marching towards the house after the first of the rains once in San Jose, partly because I had a baby in there, and it didn’t seem right. We poured a strip of paraffin and lit it to make a firewall, and off they scampered (possibly with hastily made plans to regroup in a garden down the track). It’s good to read up, and be prepared. I had a kind of manual on babies sent from England when George was born. It was pretty useful on topics such as how to gently support a baby’s head, and what temperature to run their tub, but not too helpful on what to do when you’re trying to lay a baby down for a rest and your house starts falling apart and sliding down the mountainside on account of minor earthquakes and poor construction. So instruction manuals have their limitations. I’d probably put them in the same category as a hope and a prayer. Something else no manual here covers, is tsunamis. Not infrequently, particularly when there have been a small tremors, I study the terrain behind the house, which is at first steep, and then vertical, generally impenetrable, and somewhere not to go unless you have a thing for fer-de-lance snakes. I think it’s also where the puma lives. ‘Yeah! Right! Well, good luck with that!’ Brad Kittel of Tiny Texas Houses said, making a ‘bad idea, man’ face, when he asked where I was off to next, after our interview wrapped up, explaining in detail how the ice caps are melting, and great slabs the size of countries or counties or states are on the brink of crashing into the ocean – right now – creating great walls of sea and flooding coastlines around the world. I think that’s why I like reading Common Sense Pest Control Quarterly. A lot of things in life seem daunting. Ants, I can cope with.